Basically Joy: December update: Christmas, Fitness, & Fashion! Christmas morning - Santa had arrived! We are just a few days away from putting 2016 behind us, can you believe it?! It has been way too long since I posted so I thought I would give a little update along with a roundup of my IG (follow me!). So first off let me just say, I apologize for letting my blog get pushed to the back burner this month, but in all actuality, I’m not sorry because I have spent a huge amount of quality time with my out of state family! I have enjoyed every day of this month to the fullest, and I can’t be too sorry about that! I spent this month, more or less, 50-50 between Texas and Oklahoma. I am looking forward to getting back on track with everyone come the new year though! At the beginning of this month, our family welcomed the first beautiful baby girl into the world. She is an absolute doll and I will probably end up making more trips than in the past up to see her and my nephew, who is an all-star wrestler now, in OKC. Just a couple short days later, while I was still in Oklahoma, my friend and fellow blogger, Camille (The Cocooners) welcomed her handsome little man! You should definitely go check out her little boy and all about her labor story! Let me just tell you that (I’m not even kidding), at least 6 other people that I personally know had their babies in a matter of 4 days. Uhh… keep your water away from me thanks! Clearly, for my friends, 2016 was the year of the babes! Being with family for over 10 days total definitely got me off track with my healthy eating and fitness so that is all changing this week. To get me back on track, I have enlisted the help of my friend & personal trainer, Delani Lewis. Go check out her YouTube channel or Instagram for some killer workouts along with killer makeup tutorials! She built a program just for me that I started this week, giving me a jump on everyone making health their New Year Resolution. Day one was yesterday and I’m already sore, which is definitely a good sign! With the help of Delani & Santa, who brought me my very first Fitbit –Charge 2 model – as well as a new Paleo cookbook, I’ll be looking good in 2017! 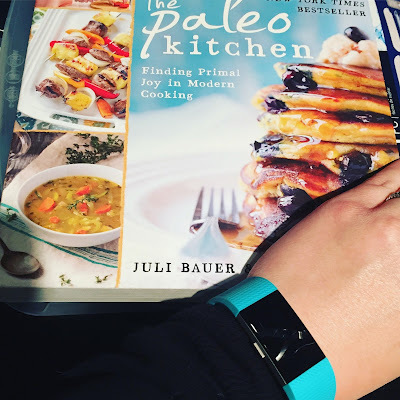 Since I did get a new cookbook, this means you should get excited because I will be pumping out recipes soon and as a plus they will be healthy so you won’t feel bad! 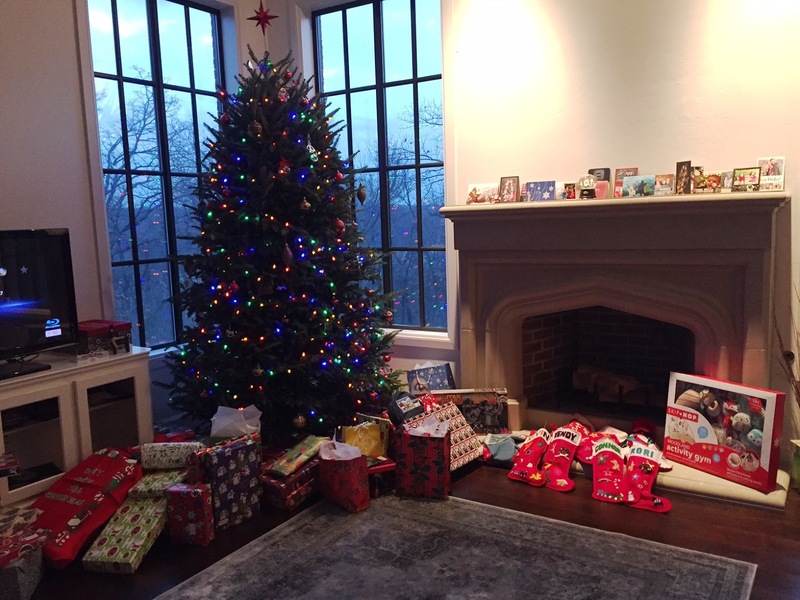 I hope Santa (& family/friends) was also kind to you this year. Two of my favorite gifts that I am a little smitten over, other than those 2 above, are my new Tiffany Blue Rtic tumbler & beautiful Kendra Scott "Krista" necklace from the mister. I absolutely loathe drinking anything but ice cold water and if you do too, I highly recommend getting an Rtic or Yeti tumbler. I personally asked for the Rtic tumbler since it was $10.99 versus $39.99 for the Yeti and I didn't see the need in my family spending the extra money. I’m only on day 3 of using this gift, and it is life!! Haha – no more half full water bottles loaded up on my desk! 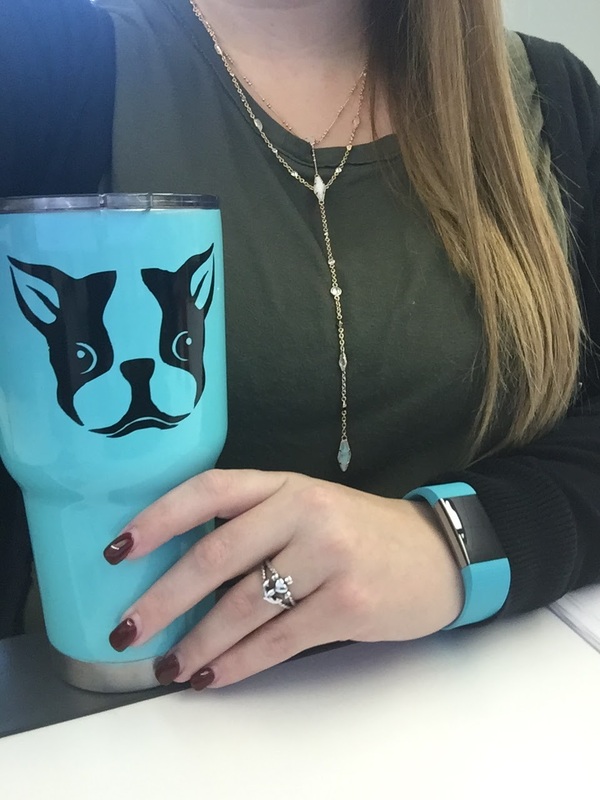 Not only is it super useful but also extra adorable since my SIL went the extra mile to have a cute little Boston Terrier face put on it! Now to this Kendra Scott piece – le sigh – that he picked out all on his own. He is so thoughtful knowing that I had recently trashed a cute little boho necklace because it kept snagging all my clothes, no matter how many times I tried to fix it. 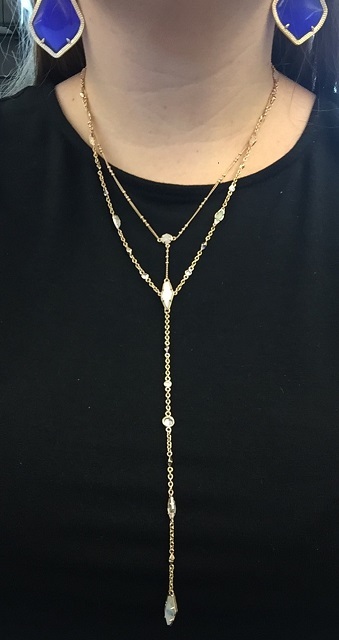 Obviously he knows I love anything KS but this piece is perfect and rose gold – which is my favorite! Don’t you love gifts that are exactly what you wanted without knowing it is?! "Year of the babes," lol! Congrats again Auntie Joy!! Thank you so much - we are blessed! Sounds like a busy month! Love spending time with family and friends and what a better time to do that than the holidays! Congratulations!! She is an absolute doll! Hope you enjoy the rest of the holiday season! Thank you! She is precious and I adore her to pieces! I hope you have a fabulous NYE! Looks like you had a great December! I have the Fitbit charge HR & wear it daily, hope you like yours. I am living in this Fitbit, I love it so much! I have already ordered a couple of new bands for it also!